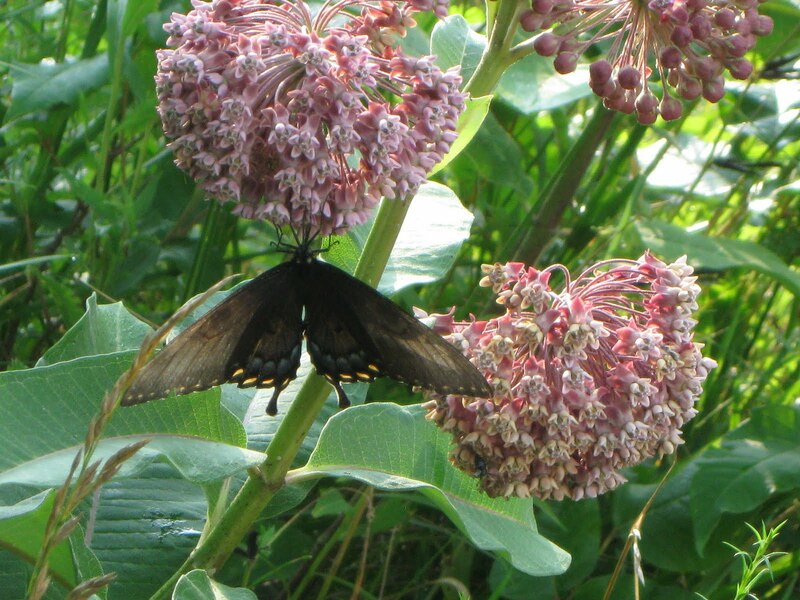 As I drove along the dirt road by my home I spotted this large female Eastern Tiger Swallowtail making a landing on the flower of the Common Milkweed plant, Asclepias syriaca. 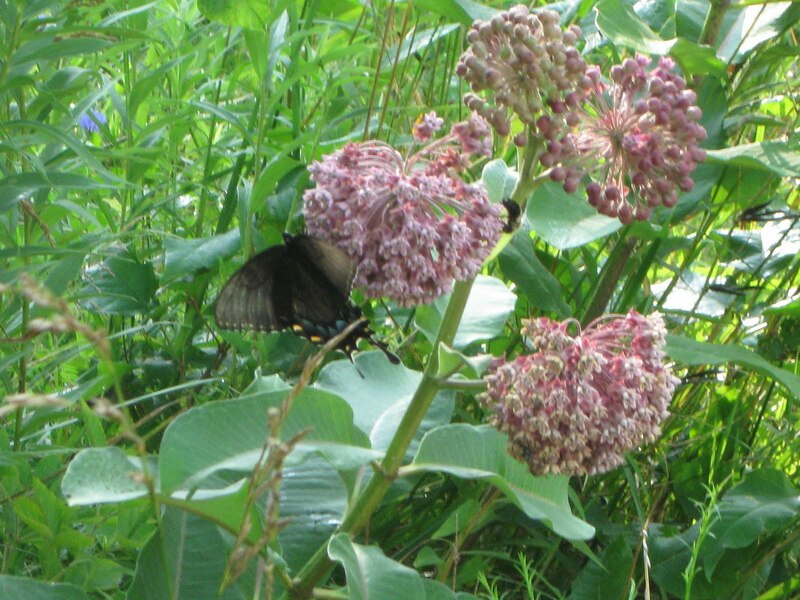 Milkweed is a wildflower native to North America and is a host plant to the Monarch Butterfly. If you enlarge the above photo by placing your cursor over it and clicking, you will notice a bumblebee flying straight for the flower that the butterfly has landed on. The female Eastern Tiger Swallowtail has two coloration forms. One is similar to the male being yellow and the other is called the dark form which is like the female in these photos.To view the male, a startling beauty of yellow and black stripes, and to also find out more about their stages -- click here. As of yet I still am learning how to identify bumblebees, there are so many species in North America -- click here. 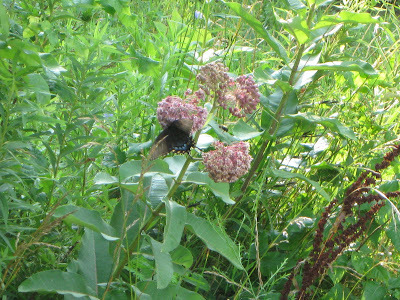 The bumblebee in the photo above can hardly be seen. It is to the right of the butterfly and appears as a black speck. In the next photo below one can see the bumblebee a tad bit better. A bee, a wildflower, and a butterfly are all wrapped up in one endeavor. 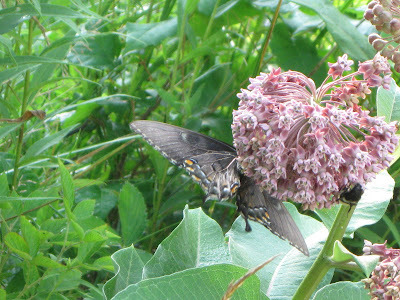 One the bearer of nectar and the others receiving the nectar. A symbiotic relationship of sorts. This is a micro- community of nature and portrays the giving and receiving that it involves. 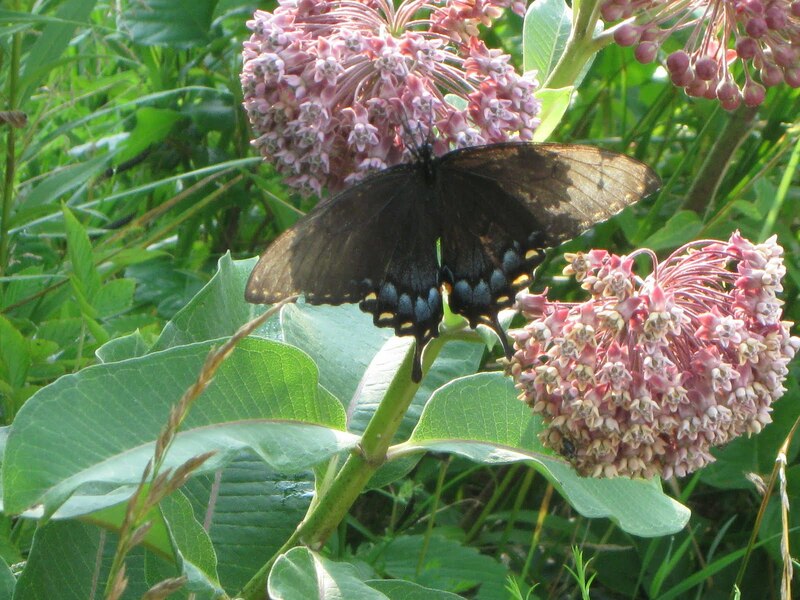 Planting, growing, pollinating, producing, nourishing, dying, decaying. We begin again ... planting ... a cycle of life within the cycles of the cosmos. 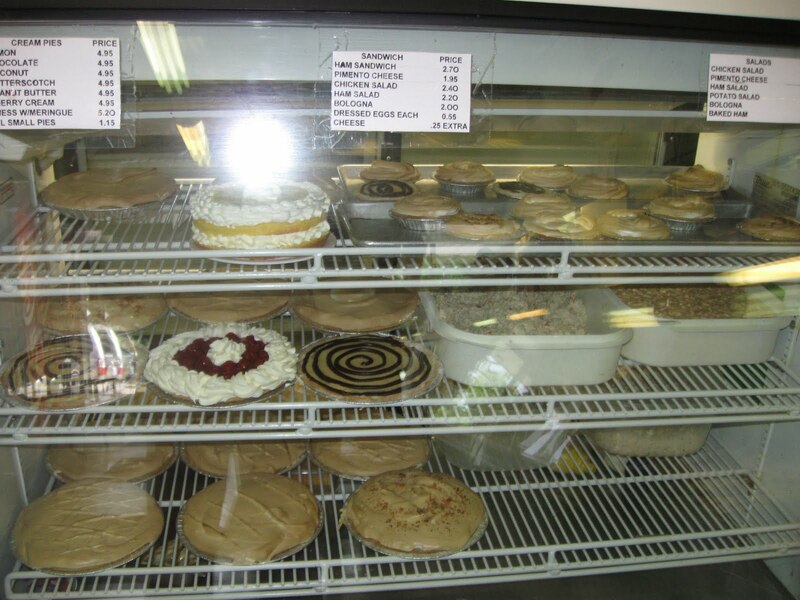 At three a.m. a crew of bakers arrive to prepare from scratch all the bake goods and deli items for Burke's Bakery and Delicatessen in Dansville, Kentucky. Above one of the bakers is preparing crust for their cherry individual pies. 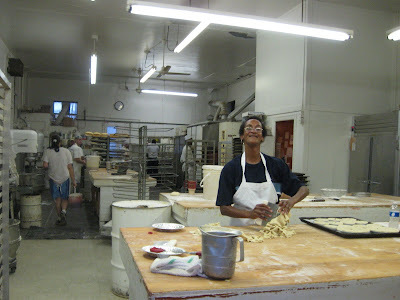 In this room where she is working, it is ten o'clock in the morning, and much of the baking prep work has been completed. 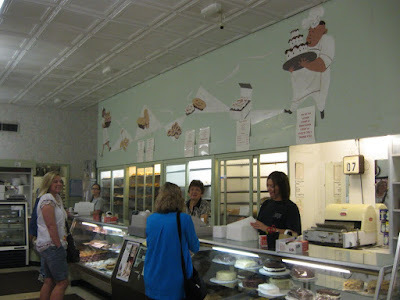 A large task as Burke's is a popular bakery and people start streaming in when the doors open at seven in the morn, six days a week -- on Sunday they open at noon. 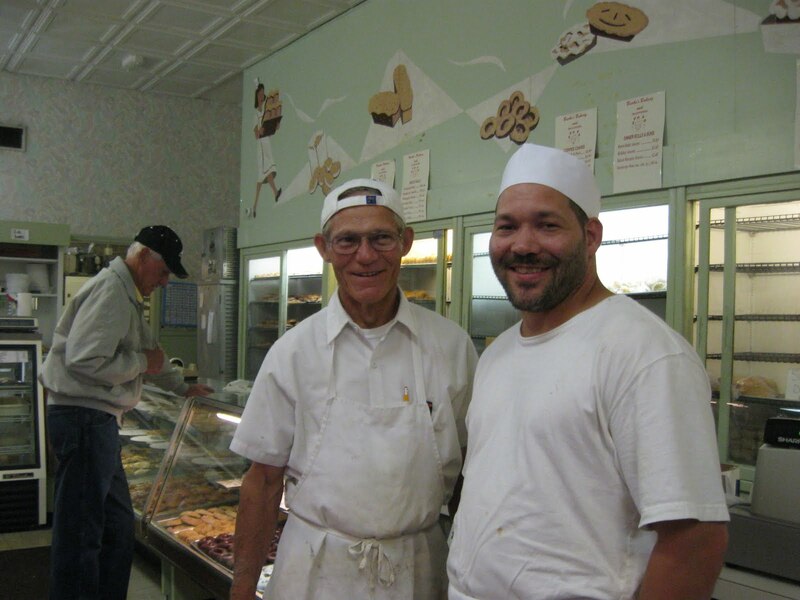 The bakery is owned and operated by the fourth and fifth generation members of the family that work right along with the store employees -- above Joe Burke and to the right his son Joedy Burke. Joedy told me that it is rare to find a bakery today that bakes every thing from scratch. A long line of glass cased counters line the entire one wall of the shop. 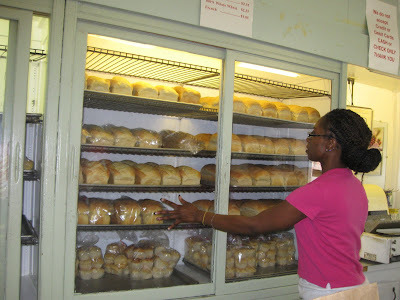 Clerks are kept busy waiting on the many customers and restocking the trays and cases. The clerks were very friendly and helpful to me when I told them I wanted to take photos. 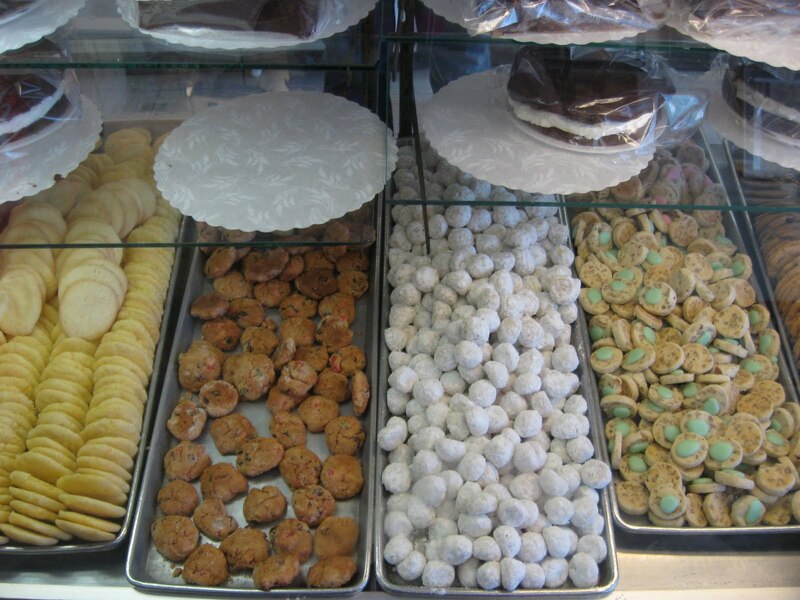 My daughter and granddaughter were with me and they bought some of their delicious chocolate chip cookies and donut holes. I usually don't eat sweets but I tried some of the goodies from my daughter's bag and I can attest that they melted in your mouth. On the upper part of the wall behind the clerks is a vintage painting of bakers that is original to Burke's -- from about the forties or fifties. Della is selecting some whole wheat bread for me. 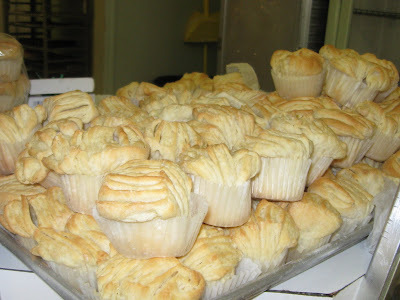 They also have -- French, Salt Rising and others. OK, the rest of this post is a visual treat if you are a lover of sweets. 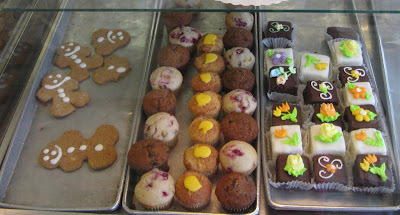 I don't know the names of all the beautiful baked goodies but they were sure very strikingly graphic. 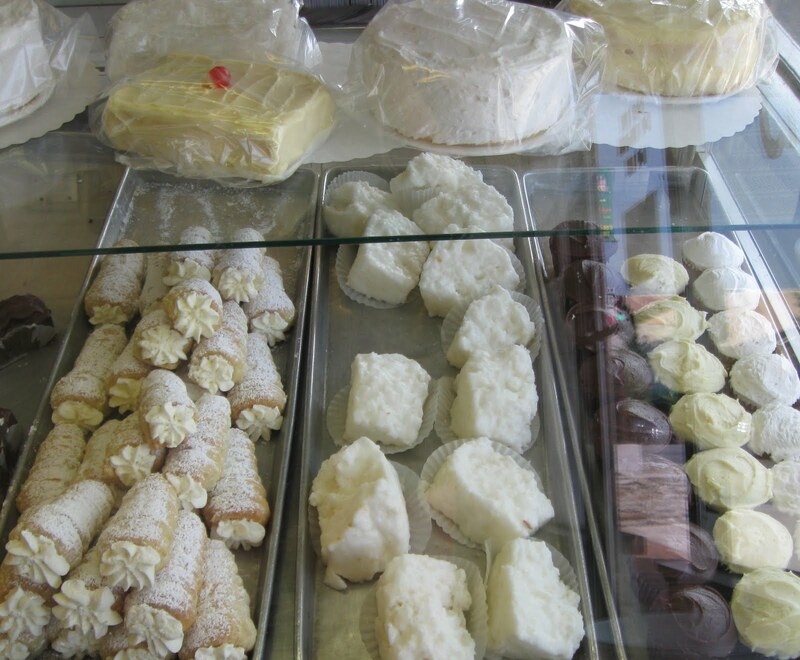 This case holds the deli items that are take-out just like all the baked goods. If you enlarge the menu on the case you will get an idea of what they carry and the price. What a "sweet" place this store was. We had originally stopped in the store for directions as we were lost and ended up being treated to an old way of doing business -- from scratch! 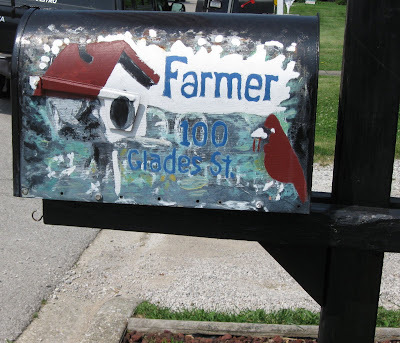 Earlier this year I posted some unusual mailboxes that I had taken photos of out in the country. The above mailbox was recently found in a small town in Kentucky. It is rather unique for a couple reasons. One, is that is was painted by a family member of the owner of the mailbox. And two, the painter is a well known artist in Kentucky by the name of David Farmer. 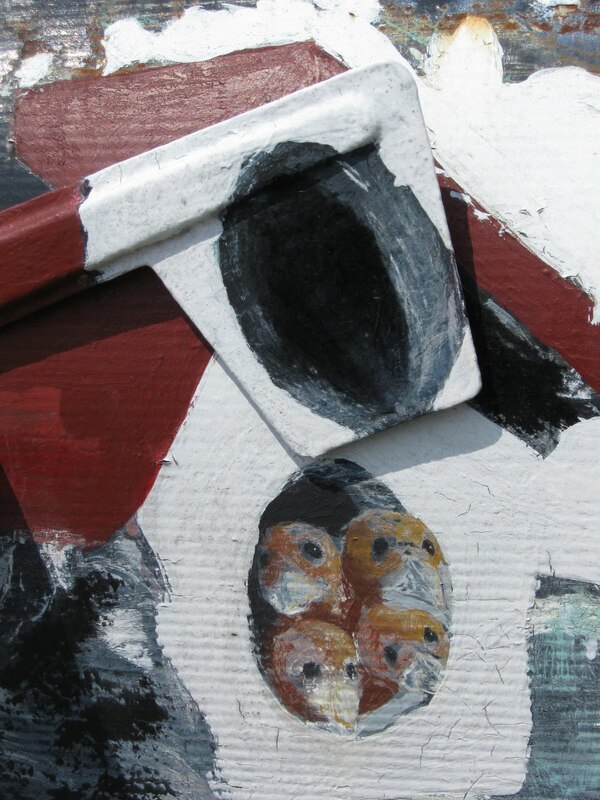 The truly unusual part of the painting is that the flag appears to be part of the bird house painted on the box. However, when the flag is raised it reveals a brood of chicks gazing out of the birdhouse hole. WHAT IS THIS OLD KENTUCKY FARM OUTBUILDING CALLED? I noticed this farm outbuilding several months ago and was stymied. I had many questions about it but the farm owners were not home and I was forty miles from where I lived so I snapped a few photos and went on my way. I have not been back to that area since. 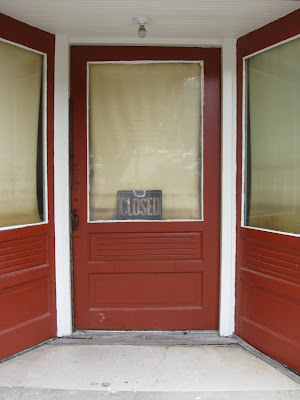 My questions about the outbuilding still linger in my mind. What was it called? What was its use? How old was it? Was it still being used by the farm family? 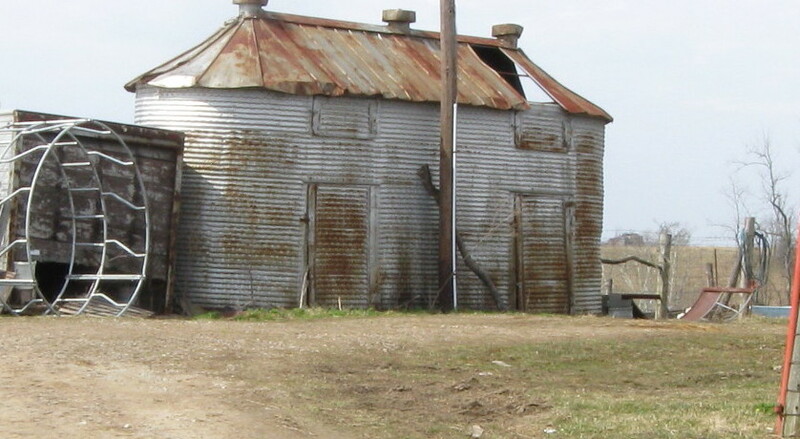 Structurally it was constructed of corrugated steel in an ovoid shape. . It had a metal roof, three metal roof vents, two metal doors from my angle of view, and two metal closings near the roof line. I could not see the sides or back. 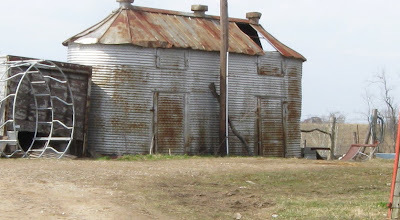 I find all old farm buildings fascinating as they usually have stories to tell. 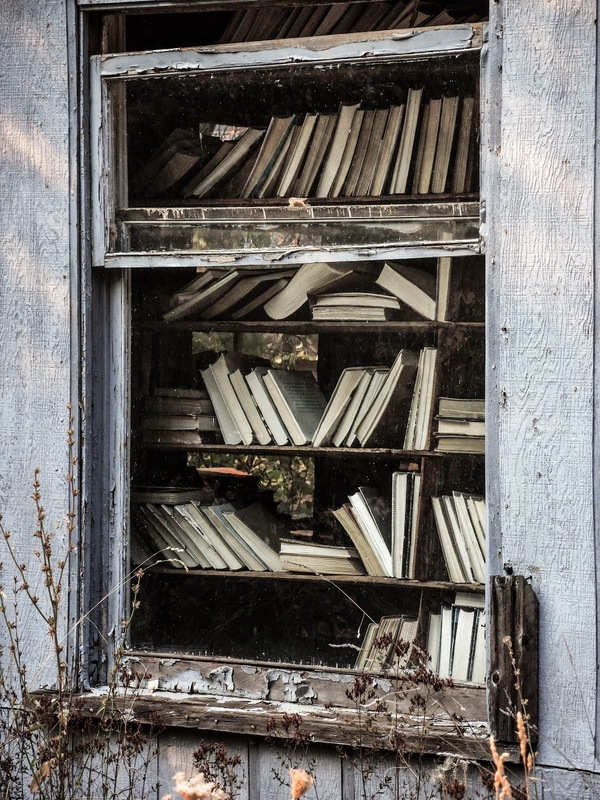 With time these stories disappear as the structures leave the landscape. I hope that someone familiar with this structure makes a comment on this post to let me know what exactly it is called. 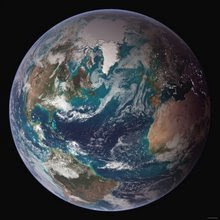 I have researched online and nothing comes up that resembles it. I thought it looked like a precursor to a silo. My photos were taken from the road. A barn sat fairly close to this outbuilding but I failed to get a good picture of it. 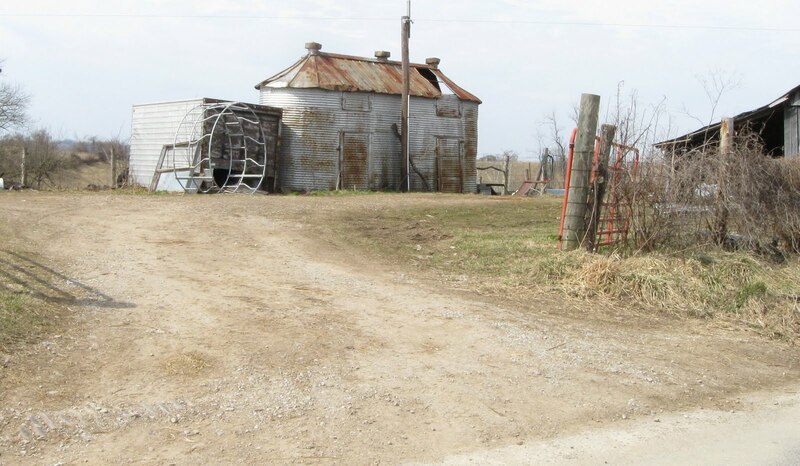 I thought that perhaps since this unknown outbuilding was fairly close to the barn that they were used in tandem -- like maybe a granary storing feed for cattle? This particular outbuilding is located in the Possey area of Madison County, Kentucky. Perhaps it is a common structure in Central Kentucky??? Or elsewhere??? Double set of entrance doors to Cox's Hardware store. In business since 1907. The small town of Mt Vernon's streetscape reflected in their door windows. 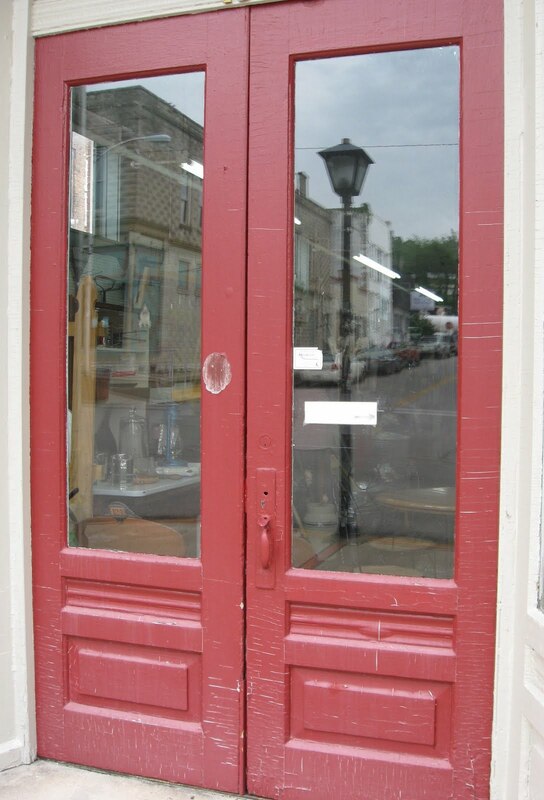 Appears to be original entrance door on a vacated storefront business. Tile work entrance also appears to be original. Approximate building age -- 100 plus years. 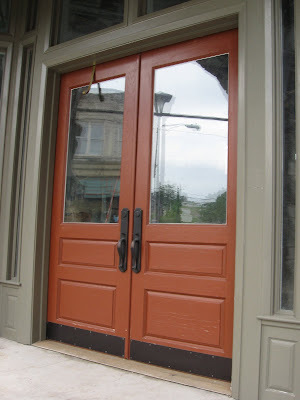 Commercial entrance door -- 1940s type -- stands empty. 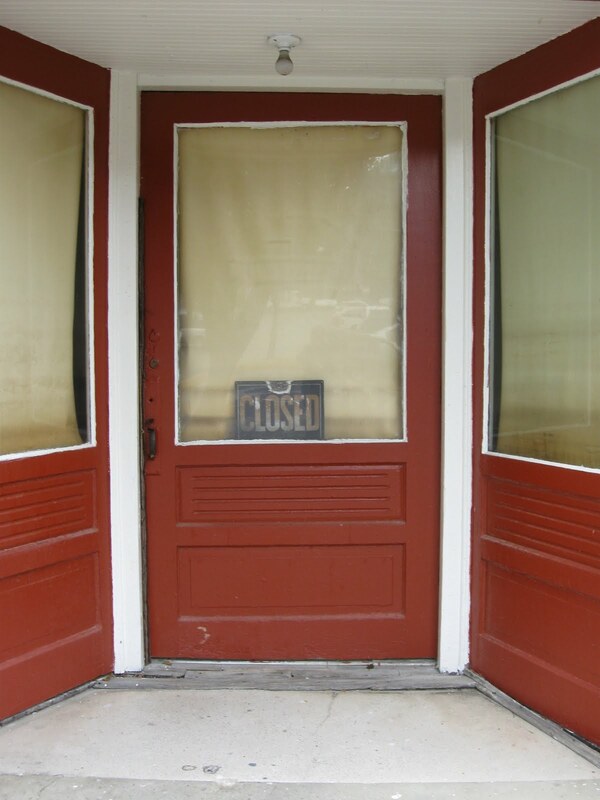 Empty storefront double set of doors. Building architecture is Romanesque style. 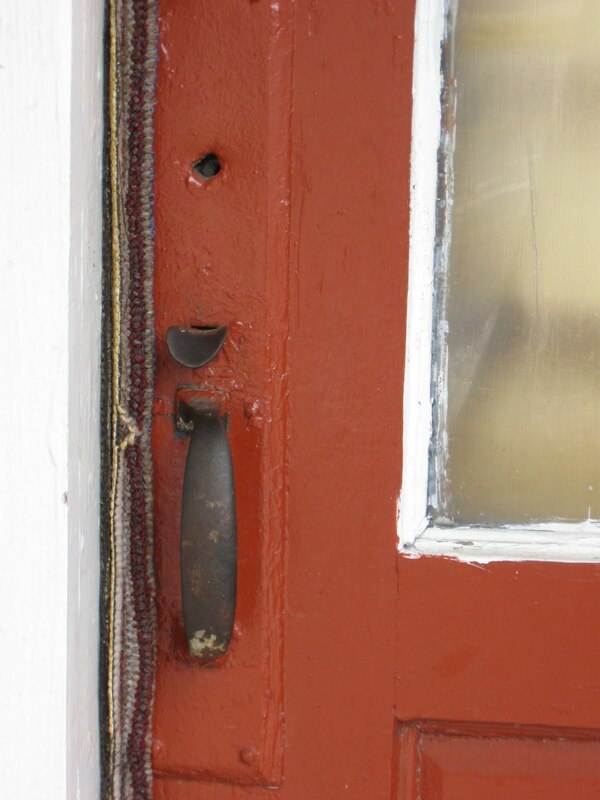 Appears to be original hardware on recessed entrance door above. Labels: APPALACHIA, HISTORIC ARCHITECTURE, KENTUCKY, MATERIAL CULTURE, SMALL TOWNS, VERNACULAR ARCHITECTURE. 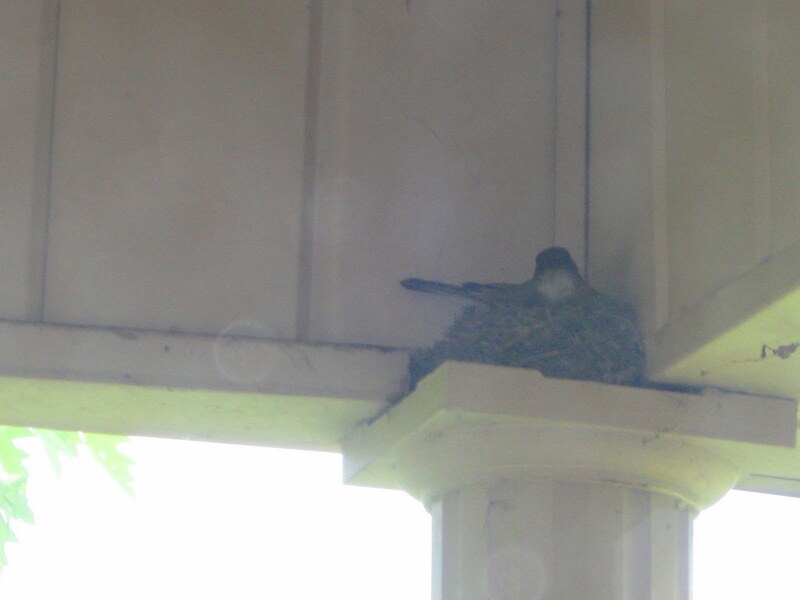 A few hours ago an Eastern Phoebe chick fell to its demise apparently from its nest. It landed on my cement porch. A sad occasion for the parents as well as for me. I had watched the parents from the start -- selecting the site on the top of one of my porch columns -- building the nest- sitting on the eggs to keep them warm, and nourishing them with food once they hatched. Here is how I discovered what had happened. I heard the Phoebe's urgent distress calls outside my door. I thought some critter was disturbing the nest. 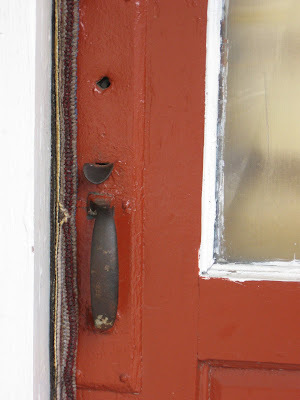 When I looked outside the door -- there on the porch was a well developed little bird, not alive. I had been out on the porch about 15 minutes before this disturbance was set off. Apparently, I deduce, it happened right after I went back inside. For the past three hours the parents have been circling the area constantly crying fee-bee and making a rapid clicking sound. 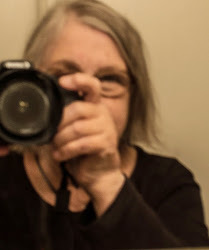 A few times flying to the empty nest, perching on the edge and looking downward into the nest. A nest that was now empty. I had seen one other baby in the nest -- perhaps he/she fledged and this one just didn't have the wing power when he/she fledged. The parent's are acting very stressed. And why shouldn't they be. All that love and care they had given their brood. 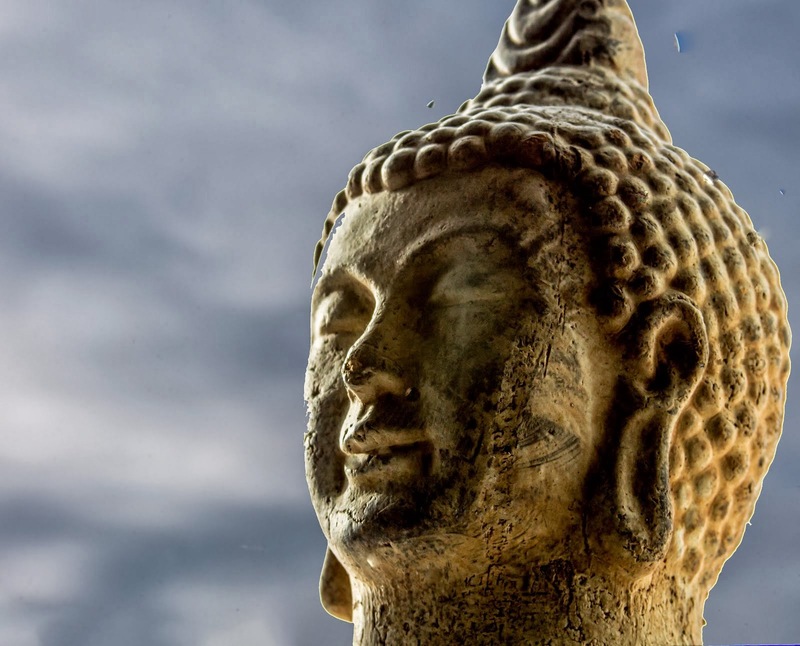 We are all connected -- no one can tell me differently. Emotions are within all animals. Although, many will disagree, I recognize grief and that is what I saw and heard today. And as I say these words above, I think of the wildlife of the Gulf of Mexico. In my heart the grief that is emanating from its wildlife is numbing and overwhelming. I was standing on a hill overlooking the quaint village of Paint Lick when I took this photo of their commercial main street a couple of winters ago. 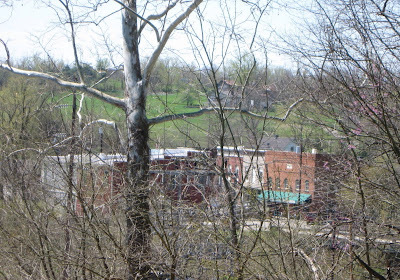 Paint Lick is but one of the many small towns in Kentucky that strive to flourish under ongoing changing circumstances. This village consists of a very small commercial area (the proverbial main street) which serves the rural residents of the area. 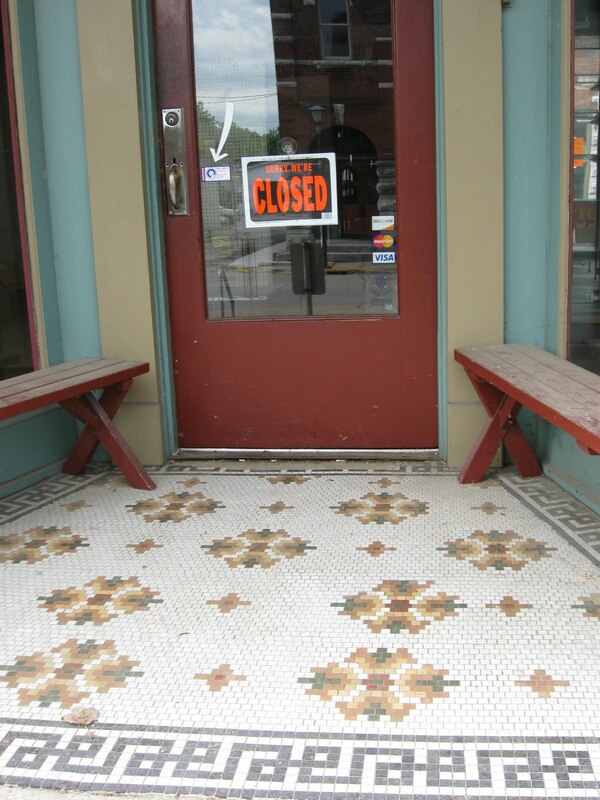 Of course, in today's economic world such small main streets can only provide limited offerings. 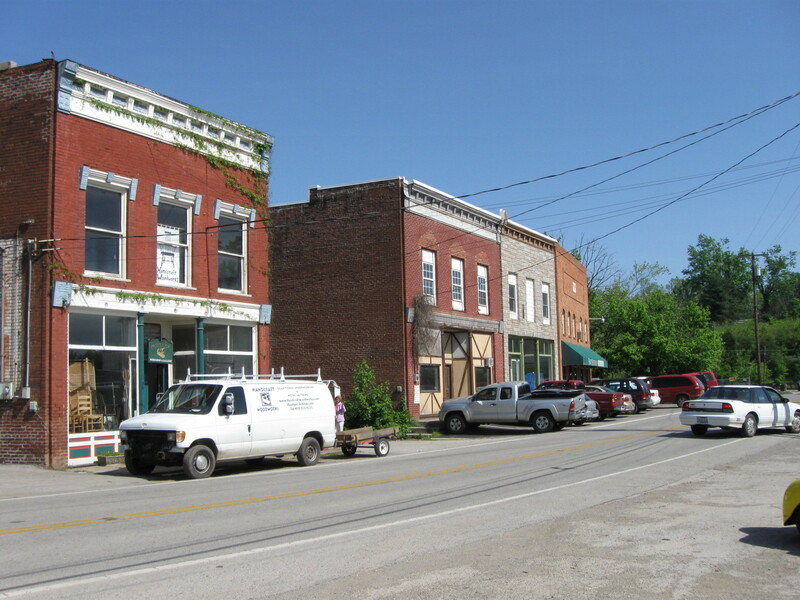 Many of the small towns and villages in Kentucky keep glued together by being located fairly near an urban city that can provide much of what rural residents cannot get locally. However, small places such as Paint Lick offer what many folks are looking for: low crime, neighborliness, strong community, family ties, heritage, and the strong intangibles that these factors imply. The combination of access of an urban area and strong community spirit attract some new people while sustaining the existing residents. Residents learn to work with what they don't have in terms of services. 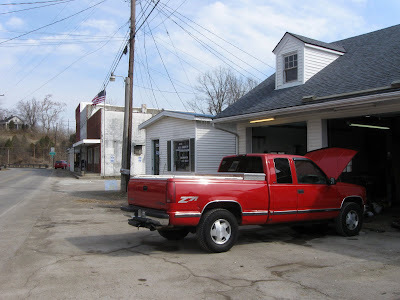 Paint Lick doesn't have a gas station but it does have a car repair garage, bank, post office and until recently a cafe where the locals would converse about various subjects such as farming. Unfortunately the cafe recently burnt down. In 1939 a book was published titled the WPA Guide to Kentucky. It was part of Roosevelt’s New Deal program to provide employment for writers under the Federal Writers Project. He commissioned writers to publish state guides of discovery for tourists as well as for residents to become more knowledgeable about their state. Where am I going with this information? Well, I have a 1996 re-published edition of the 1939 edition of the WPA Kentucky Guide wrote and researched by the Federal Writers Project. I wanted to get their definition of Kentucky in 1939 as well as that of Paint Lick. 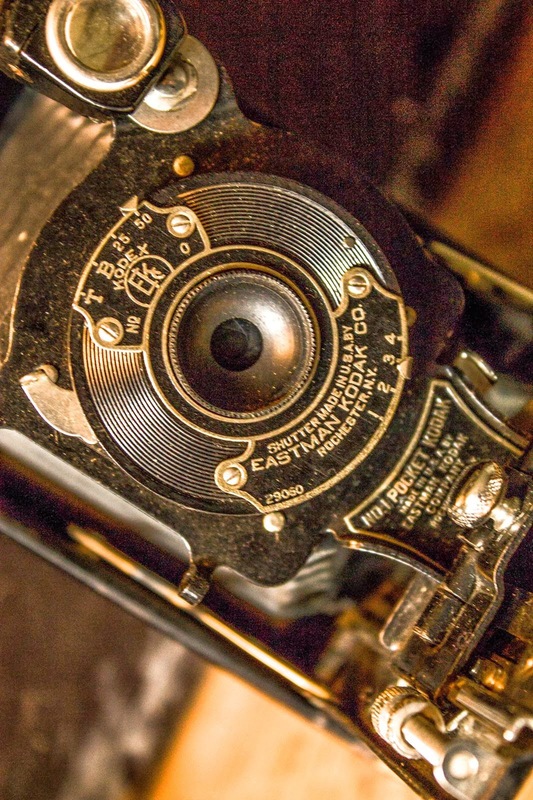 The writers felt that their writings should be more than about history, that it should, “capture the spirit of the land, mostly rural, indefinable but very real." This is what I wanted to hear -- writers that looked at the soul of a place. 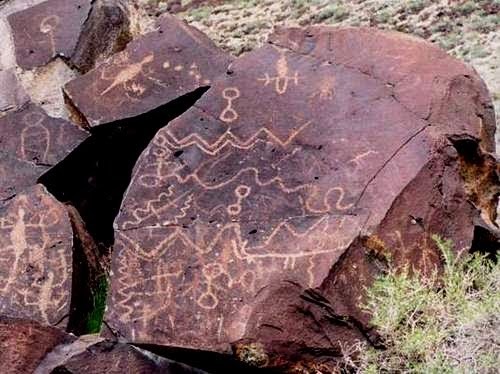 Although Paint Lick was limited to a very short mention they were able to write something significant that I had not been able to find elsewhere in my research -- that of the Indian symbols. Here is the short mention of Paint Lick: . . . a hamlet near the site of Paint Lick Station, which was established in 1782, and so named because the first settlers found Indian symbols painted in bright colors on trees and stones along the creek and around the near-by salt lick." 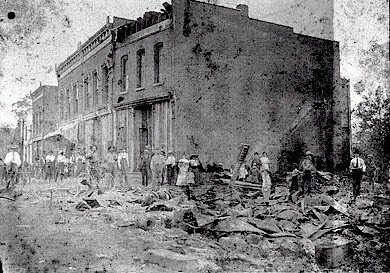 PAINT LICK MAIN COMMERCIAL STREET IN 1908 AFTER THEY SUFFERED A FIRE. 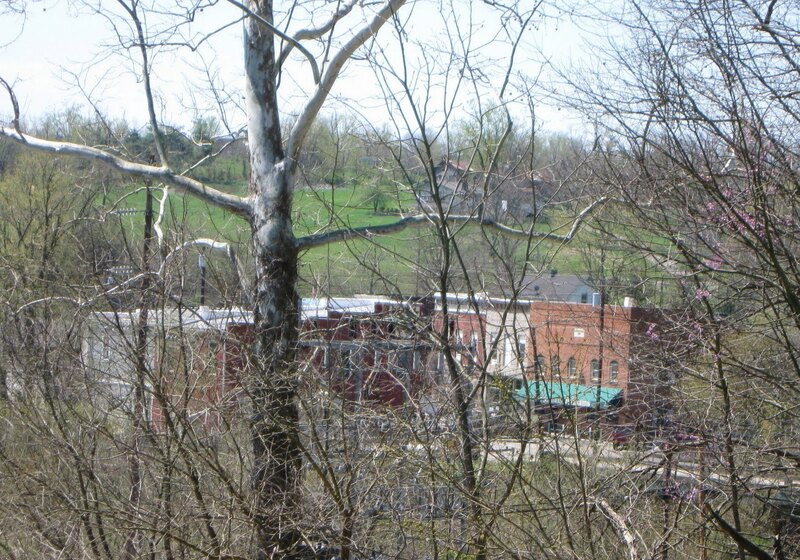 Paint Lick is a small town that manages to stay afloat because of its proximity to an urban area. It still has its small town flavor while growing incrementally. It has faced many challenges since its first days of settlement. 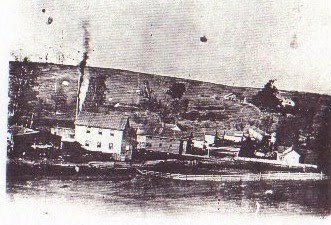 One example is the tragic fire in the above main street photo. It has experienced population shifts mainly in the 40s through the 60s to the Midwest for manufacturing jobs. Presently rural farmers are experiencing a change of their farming culture -- from growing tobacco as a prime cash crop to now finding new crops to provide continuing farming opportunities. It appears that staying viable for small towns and villages is an ongoing process that takes stamina of the rural population. 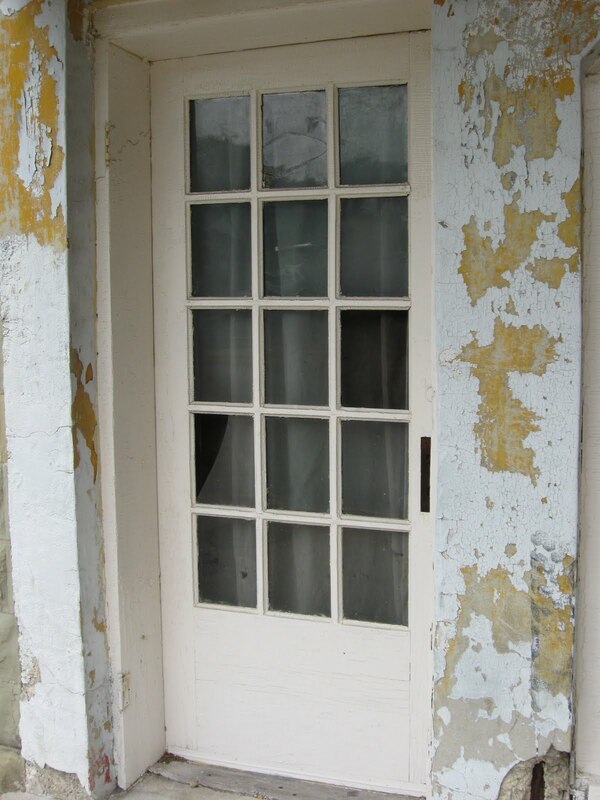 At one time Paint Lick consisted of mainly wooden buildings pre 1908. Its tenacity to the land provided the impetuous to remain a slowly growing village. In 1939 the population was 250 (WPA Guide to Kentucky), 2000 the population of Paint Lick was 2,084 (city-data.com) and in 2007 the population had increased to 3,293 (city-data.com). One of the factors that is important to look at is the age of the residents. Age diversity indicates a viable population. 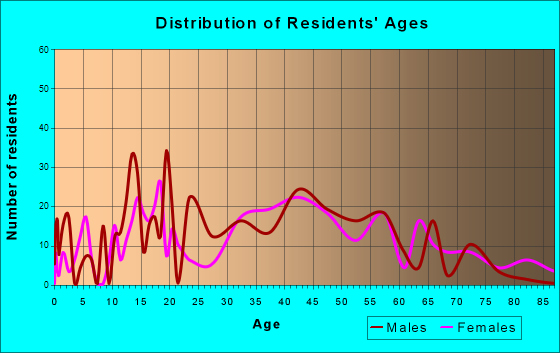 The graph above shows that Paint Lick has citizens of all ages. Some for delight such as young children, many for working power such as the middle ages, and several in the older ages to hand-down proven ways and wisdom. Paint Lick has the tools to survive as a rural village. 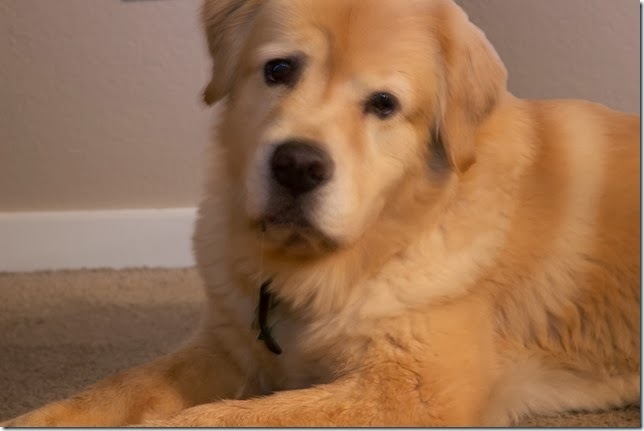 On the first evening of June about 10 PM I was letting my dogs out the front door for their last call.. I usually let them out the back but this night I was being lazy and knew the front door would be quicker. As I opened the door I was greeted with a spectacular phenomenon the likes of which I had never seen before in my life. I live on a ridge of Bear Mountain and have a surround view of the mountains up to their tops and also a narrow low-lying, flatland fissure that runs below which they call a holler in Kentucky. 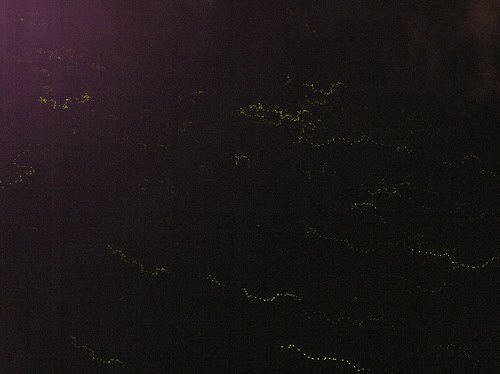 What I quickly saw in front of me was a light show of thousands of fireflies (lightning bugs) flashing all along the holler below rising upward to the tops of the surrounding mountains. I slowly stepped outside completely in awe of such a remarkable display. I sat watching for about fifteen or twenty minuets, then bid the fireflies goodnight telling them that I would be back tomorrow. 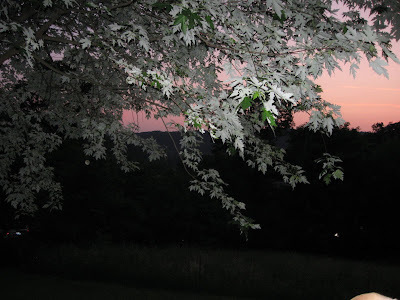 The next evening, I sat on my front porch during the same time and place as last night, but no thousands of fireflies? Fireflies yes, it was the usual number that I see at this time every year. Then I went out again the following couple nights, same time, same place, and again only saw the usual amount of flickering firefly lights. Nothing to even come close to what I saw on that first evening in June. 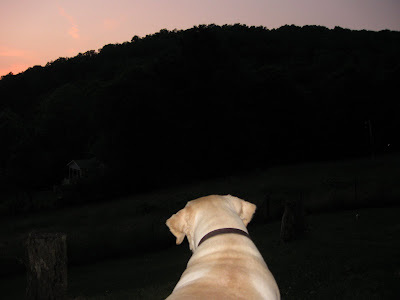 I scratched my head and wondered what type of occurrence had happened on that first night when so many fireflies were flashing like small twinkle lights all up and down the valley heights? WE SPOT A COUPLE FIREFLIES ON SUBSEQUENT NIGHTS. Yesterday I received my June/July issue of National Wildlife Magazine and there was an article about fireflies, Photinus carolinus, and their synchronized flashing -- flashing by the thousands. These occurrences were mentioned as happening in the Great Smokey Mountains in June around 9PM to 10PM. Could this be a similar event that I witnessed? The magazine described the incredible flashing display as starting out in the dozens, expanding to the hundreds and then into the thousands.They flash together for 4 seconds then pause10 to 12 seconds. The flashing is actually a way for males and females to connect to each other -- it's their "come hither" flash that promotes the species. Perhaps it's a once in a lifetime occurrence for someone like myself to observe? No matter if it was a flashing synchronous firefly show or some wonder of the cosmos, to me it appeared as another of nature's beautiful mysteries. 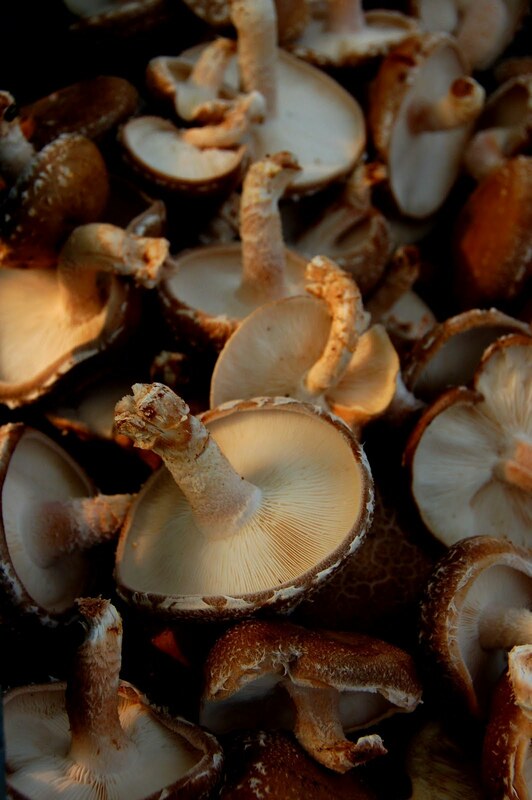 Above is a plate of Shiitake mushrooms that were for sale in early spring this year at the Berea Farmers Market. 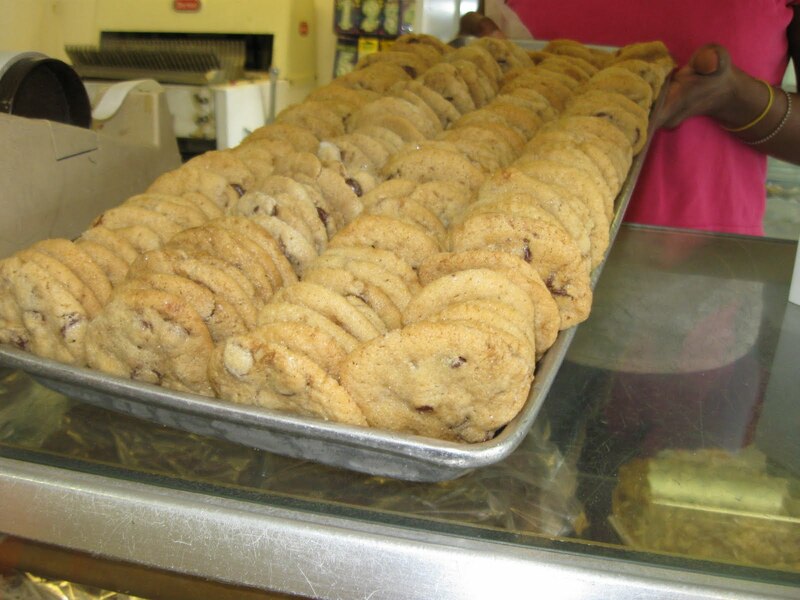 They were being sold by the pound by students of the Berea Agricultural Department of Berea College, Berea, Kentucky. I buy the Shiitakes every year from the students, eating some fresh and drying the rest. This year I decided to find out more about how the students raised the mushrooms. I had not a clue as to the process. In a small woodland patch on the Berea College campus are stacked logs that produce the fabulous Shiitakes. It is an area that has little sunlight which helps retain the moisture creating an ideal environment. I was able to talk to Sean Clark, staff member of the Berea College Agricultural Department. He gave me a short albeit informative lesson in how they go about mushroom gardening. He stated that it is an ongoing process. 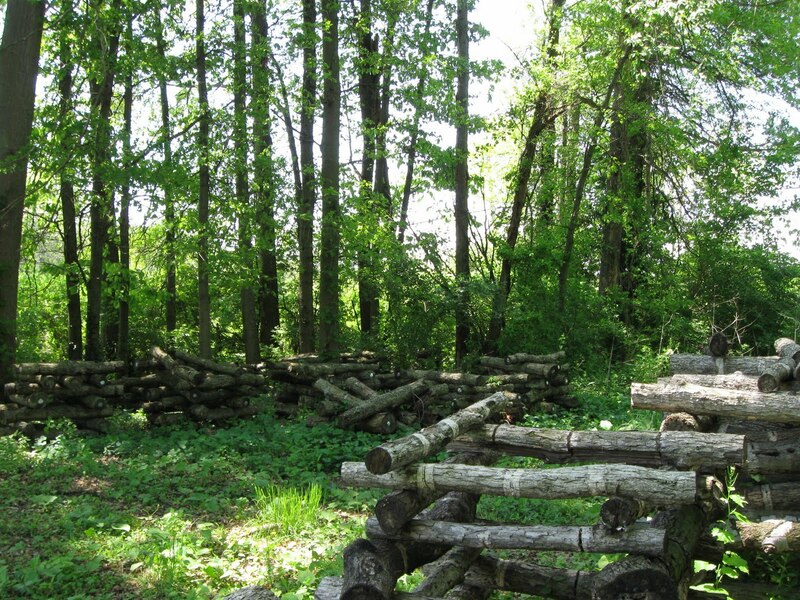 White oak logs are gathered in January when the Berea College woodland properties are culled. It is important that the logs are dormant. To step back a bit. 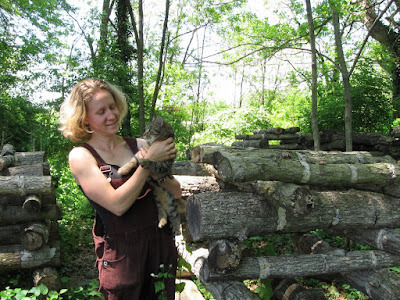 Before the logs are stacked and after they have been gathered in January they undergo first, inoculation, then, an "incubation" period. I call it incubation although Sean did not. In my mind it was the best way to understand the pre-stacking process. Inoculation is done sometime in January. The inoculation is done with a fungal and sawdust mix. Several chain saw cuts are made in the logs and filled with a this mass which is called a spawn. Then the saw cuts are wrapped in duct tape. This spawn will eventually produce the fruit that grows on the logs -- which is the mushrooms. Next the inoculated logs are placed under open metal grid tables in the college greenhouse. On top of the table are other plantings of the Ag Department that require regular watering every day. As the students water the plants on the tables water seeps down through the metal grids and moistens the logs below. 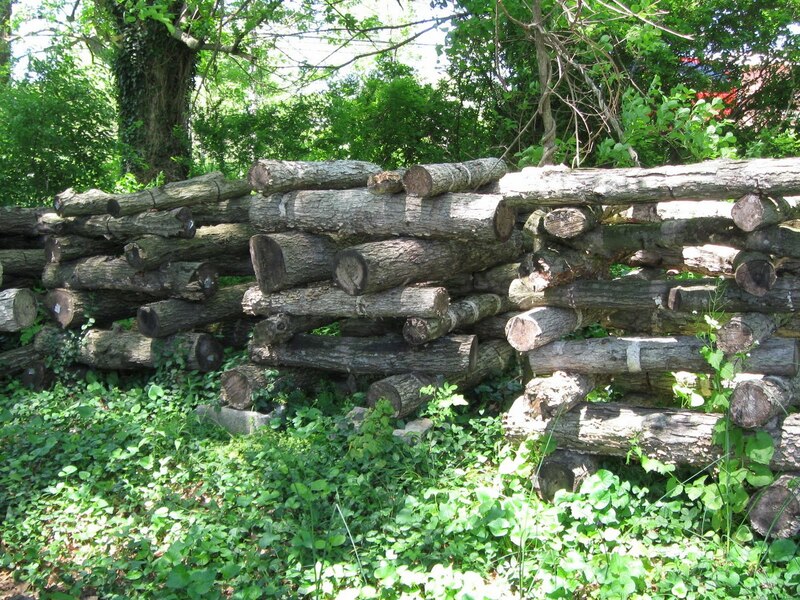 The logs begin to fruit six to eighteen months after inoculation. The logs are moved out to the log garden in the spring. At the Berea Farmers Market one can buy inoculated logs from some vendors to try their hand at raising their own mushrooms. 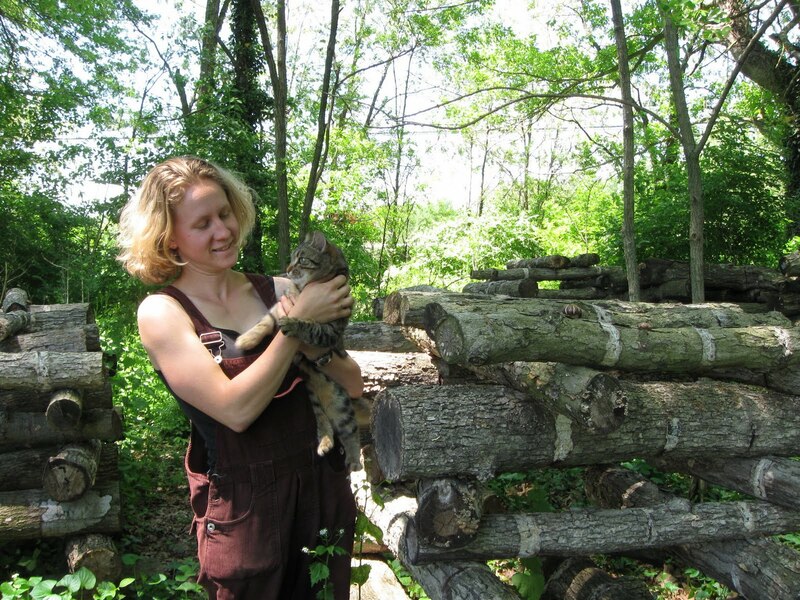 I would imagine that other farmer's markets would offer inoculated logs. 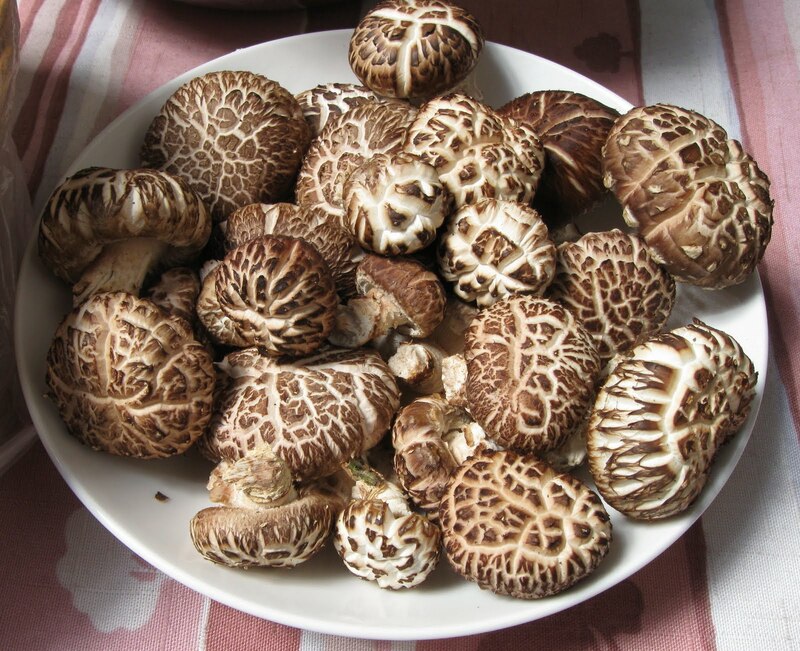 Shiitake mushrooms exposed to brief sunlight contain high amounts of vitamin D. Mushrooms are the only vegan source of vitamin D. They are also powerful antioxidants. For those that would like to try their hand at producing mushrooms at home you might want to pick up from your local library, Mushroom Cultivation: A Practical Guide to Growing Mushrooms at Home by Stamets and Chilton.